Reishi Mushroom or Ganoderma Lucidum is also known as Ling Zhi in Chinese. It is a medicinal mushroom that offers a lot of health benefits. It is one of the ancient mushroom species used for health purposes in many parts of Asia. 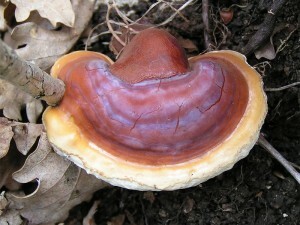 Reishi mushrooms exist in various, interesting shapes. The one with colors of reddish-brown and yellow makes it the most intriguing among the many species. Where can one find Reishi mushroom? This mushroom belongs to the polypore mushroom family and thrives well in tropical as well as subtropical climates. It is endemic in mainland China, although it can also be found flourishing in some parts of South and Southeast Asia. The species is mainly a decomposer, and so, it can be seen growing on dead hard wood. What are the active ingredients of Reishi Mushroom? What make Reishi mushroom effective as a medicinal plant are the active ingredients that it possesses. Scientists have done ample research on it to identify the components that give all the miraculous, health benefits. It is learned that the most powerful active ingredient of Reishi Mushroom is inside of polysaccharide, a compound that contains beta glucan, which is known for its immune system-enhancing properties. In fact, beta glucan is considered as one of the most efficient immune system supplements available. Another active ingredient found in Reishi Mushroom is triterpenes. This compound that is present in reishi mushrooms has ganoderic acid, the type proven to reduce or even eliminate allergy symptoms. Ganodermic acid works by impeding the distribution of histamines into the body system. It likewise regulates the use of oxygen by the body and aids the liver to function better. What are the benefits of Reishi Mushroom? At first glance, one would think of Reishi Mushroom as a poisonous plant. The reddish appearance certainly makes the plant looking quite unappealing. What’s fascinating to note that in nature usually colors of poisonous herbs and plants are blue, yellow and dark red, but the fact is that the Red Reishi mushroom has no toxicity. In other words, it is safe to use. One is assured that the use of Reishi Mushroom is perfectly safe because it is nontoxic. Once an individual uses the right amount of Reishi on a regular basis, it can restore his body to its original healthy state. It also enables all organs and systems to function normally. For example, Reishi works to improve the function of the liver. Reishi Mushroom likewise works as an immune modulator, which essentially regulates and strengthens the immune system. What makes Reishi Mushroom effective against High Blood Pressure? Reishi Mushroom is discovered to be a potent medicinal herb effective in the treatment of hypertension. These days, more and more people are using this plant as an effective, natural cure for high blood pressure. It regular use is shown to have resulted in lower blood pressure to patients who did not have any positive response to anti-hypertension medicine. It likewise reduces the incidence of arrhythmia, lower down cholesterol and triglyceride levels, and lessens the stickiness of blood platelets. So what makes Reishi mushroom an effective treatment for high blood pressure? Polysaccharides, its most active ingredient, works well in reducing blood pressure. It combines with triterpenes, a natural ACE inhibitor, to inhibit the action of angiotensin-converting enzymes. Such enzymes create angiotensin II, a substance which causes the muscles surrounding the blood vessels to perform contraction, hence pushing up the person’s blood pressure. The action of triterpenes results in the dilation of the blood vessels, which consequently releases pressure. How does Reishi mushroom enhance the immune system? Significant scientific research and studies have proven that Reishi mushroom is capable of enhancing the immune system of the body. If a user consumes the mushroom on a regular basis, it can enhance the immune system and even improve circulation of the blood. This, in effect, greatly improves an individual’s health condition. Overall, Reishi Mushroom is considered as an immune modulator, adaptogen and general tonic. It is a miracle herb that helps in treating different health problems and issues such as anxiety, bronchitis, hepatitis, high blood pressure, asthma and insomnia. Studies done in Asian countries such as Japan and China, also in the US, have shown that the use of this mushroom is linked to the treatment of various diseases. Such studies give strong evidence that reishi acts the role of a normalizing compound. It can be considered a supplement that yields health benefits because of its regulation of functions and activities of the various organs of the body. Reishi is likewise considered as an adaptogenic plant that aids the body in maintaining a healthy balance and restores it when one is ill.
What are the side effects of Reishi Mushroom? When it comes to the side effects of Reishi Mushroom, they exist only if the plant is consumed more than what is necessary. In order for the user to avoid any allergic reaction, it is advisable to start using the mushroom in a small dose of mushroom extract or tea. If taken in large amounts, Reishi mushroom can cause a number of side effects to happen such as nausea and diarrhea. Some users, who inadvertently consume too much of the plant, experience light vomiting after a few hours of taking the plant. Diarrhea is likewise another side effect which health professionals are able to diagnose in most individuals who eat Reishi. Other side effects, albeit less common, that manifest when this mushroom is taken are skin rashes, stomach discomfort, skin irritation, dizziness, nose bleeds, dry nose and dry throat. Side effects that can be experienced in the use of this mushroom can interfere in the efficacy of other drugs being taken. While high doses of Reishi Mushroom can inflict damage to the cells of the body, there are no serious side effects brought about by the use of this herbal plant. However, the use of the mushroom together with some blood-thinning medications might mean the intensification of their efficacy. Examples of such drugs are aspirin, warfarin and dalteparin sodium. Hence, it is a must for individuals who are taking these medications to stop using any supplements that contain Reishi mushrooms. Overall, Reishi Mushroom is a miraculous herbal plant that provides vital health and medicinal benefits to those who use it. If only because of its highly significant benefit, which is the lowering of blood pressure, it is advisable to consume the mushroom on a regular basis. It is still important to make sure that the right amount is taken to avoid any possible discomforting side effects.